Relate: “There are no stupid questions”. I have heard this inane statement more times than I can wish. It immediately pulls the ornery out of me and for the remainder of the training session I will be racking my brain for the dumbest possible question I can possibly ask. I say “training session” because it isn’t normally teachers but those presuming to teach teachers who would offer up such inane statements as this. Real teachers wouldn’t be dumb enough to make it. When it comes to stupid questions, I have heard some really big doozies in my time like the guy wondering if he could turn his monitor screen saver into a mirror by scanning a mirror. Seriously. That really did happen. Saying there are no stupid questions is an incredibly dumb statement in and of itself even if it does come from a noble sentiment. Questions asked without thought are dumb but it is still good to encourage thoughtful questions. Just please, be wise in how you encourage the thoughtfulness in the questioning. There is a flip side. I also have often heard an amazingly great statement made asinine by the dumb sentiment it is born out of. “God said it. I believe it. That settles it.” I prefer the less catchy but more accurate shorter version: “God said it. That settles it.” From the viewpoint of the authority of God, this is true. The problem is, I’ve often seen it used as a thinly veiled cloak for anti-intellectualism. Often, when the statement is being used what it really means is, “I don’t want to think or talk about that.” To ask questions without thought is dumb, but to refuse to think about the questions asked is even dumber. These are just ten of the many questions we should be asking. The world is asking them to us and if we haven’t found an answer for ourselves, then every time it comes up, a little more of our faith and confidence in God can die. We might be afraid of these questions but God isn’t. It is wisdom to seek out answers to our questions. It is God honoring to take these questions to Him, to study and to search, and to come through the other side like Jacob who became Israel – “He has wrestled with God and has overcome”. I believe I have answers to all of these questions. However, for many of them, I thought I had answers as young as ten but the answers I had then don’t work for me now. Hopefully, as I continue to learn and grow and mature, I will need deeper and deeper answers as I grow older and wiser. As these questions come up in conversation, I can respect those who have asked these questions and have found different answers. We can grow and learn from each other. The ones who I can’t learn from are the ones who refuse to ask, and keep asking the questions. It makes me wonder if they truly love God, or are they just sheltering behind a supposedly “easy, safe” religion. There is nothing that, when searched out, does not reveal Your glory. By hiding from the answers, by avoiding the big questions, all I do is miss out on an opportunity to better learn how great and how awesome and how beautiful You are. Sometimes those questions can be scary. Help me not to fear. You are greater. Be with me through the storms of doubt, wrestle with me as I struggle to learn and know, and stay there until the Son rises and I am victorious on the other side. That was a good post about stupid questions. I had to laugh when I heard about the man who wondered if his monitor would become a mirror if he scanned a mirror. I also like your idea of thinking up the dumbest questions possible to ask when people say that there are no stupid questions. We must all thoughtfully study the scriptures. People who wonder about God need answers which only we can give. And in some cases, such as sovereignty of God verses our choice, have the answer that both are true. Neither can we comprehend the Trinity except to understand that God is one “WHAT” and three “WHOs.” Understanding the Trinity is like expecting my rabbit to explain Quantum physics. Great post with questions so many ask but then bristle when shown the answer. The world has it grip on people and our prayer is that we be prepared to answer those hard questions with compassion yet truth. 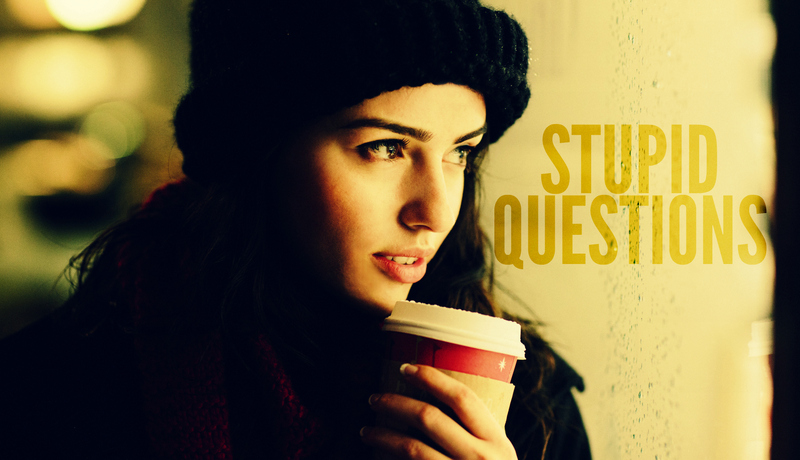 Many years ago, I heard a Bible teacher say he welcomed questions from his teen children. “Ask the hard questions while you’re still under our roof,” he told them. I love hard questions, he said, because he tells me you’re pondering and wondering too. I love questions. Surely I don’t have good answers, but I cherish dialogue. I learn from nearly everyone! Thanks for posting your hard questions. Will ponder this evening. Well BJ, I have to hand it to you, I envy your mind, I envy your audacity and I envy your courage. Sometimes I’m right there with you and other times you leave me in the dust. But never do you leave me without making me think. Thank you my friend. Blessings. “To ask questions without thought is dumb, but to refuse to think about the questions asked is even dumber.” Thank you for voicing out my inner thoughts whenever I encounter people who just believe and obey God without questioning why. When people like this encounter questions about their faith, they can’t answer it because they just simply go with the ‘because the bible said so’. Like omgosh, how can you not want to delve into the richness of your faith? Baffling, it baffles me. How would they evangelise? Your ten questions you posed were great thought provoking exercises. I answered a few of them myself and will come back to the others (I have them written down). As a novice myself, I would be interested to know your thoughts on them as well. Thank you. It would take a book to answer them all in full but you can use the search function to read other posts. I am pretty sure I have already shared my thoughts on each of these on some level or another. Here at The River Walk we don’t shy away from hard questions. “God said it. That settles it.” Good point. It doesn’t matter if I believe what God says or not, it’s still the truth. This is so good, loved it! I really enjoyed this post. Thank you for writing. How I can relate to the way answers have to mature with us! I study and seek more than ever, but I am not nearly as informed as I used to think. I loved this piece! So wise and stated so many of my sentiments too! Where do stupid questions come from? Ha!